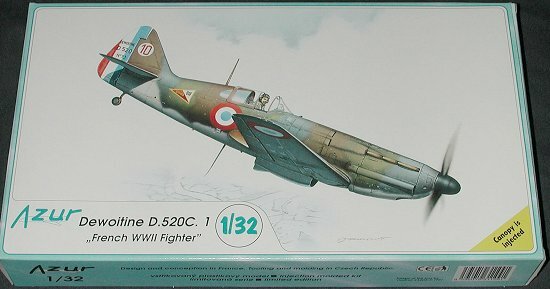 France's best fighter of the Second World war was the D.520. It was built in sufficient numbers to see some action and was around long enough to be used at the end of the conflict as well. Unfortunately for the French, their production capabilities were as confused and inept as their political and military capabilities and aircraft were unable to be used due to the lack of simple and common parts such as propellers. A case of too few too late, though in hindsight, they would have made very little difference in the outcome. Many were captured by the Germans and production continued even after France fell. Those still around after D-day, were recaptured and used by Free French forces against the Germans who held out in French port towns. Fortunately, several survived including at least one in flying condition, though its time in the air did not last long. This is very much a typical, modern MPM family kit. The panel lines are nicely engraved and crisp, the detail level is high, and it includes a minimum of resin parts. It also includes an injected canopy, though it would be nice were it a multi-piece job so that we could pose it open. However, Azur decided to mold part of the fuselage with the back part to make it easier to glue in place and for that we can be thankful. Resin parts are kept to a minimum and include the exhaust, a nose intake and various small struts and handles. Options for the kit include the ability to have the flaps and the radiator coolant door posed up or down. Just for your info, while looking at a number of D.520 photos of the plane on the ground, in most cases the coolant door was open and the flaps were up. This kit does have the dreaded separate prop blades, but at least the spinner is plastic and not resin. There are optional spinner tips, one longer than the other, provided, though they don't equate one or the other with the markings options. A few small parts, like the gunsight pedestal, will have to be scratchbuilt. Instructions are very well done as on all newer MPM family kits, and provide color info where needed. The two decal options are both painted in similar schemes of Dark Blue Grey, Khaki, and Dark Brown over Light Blue Grey. The patterns are similar but not the same. One is for a GC 1/3 aircraft in 1940, as shown on the box art. 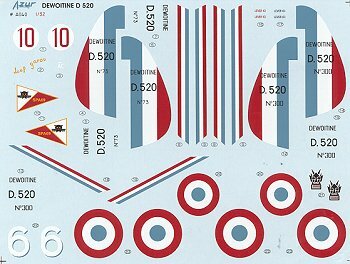 The other is a Vichy GC III/6 plane complete with red/yellow nose/tail stripes and the thin red/white and blue strips on the fuselage and wings as flown in Syria during 1941. Decals are the typically superb variety provided by MPM and show no registration problems at all. They are quite thin and if the past is any indication, will fit perfectly. I'm really quite pleased to see this kit being done. 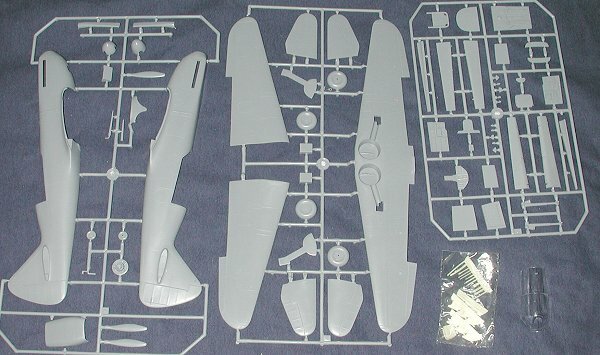 To my knowledge, it is the first WWII French fighter done in this scale in injected plastic. The build looks to be quite easy and preliminary construction shows no problems at all. Kit courtesy of my credit card (for which Capital One is quite happy). Please follow this link for a full build review of this kit.